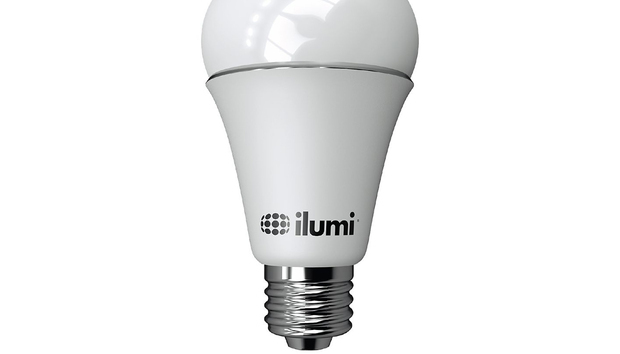 The latest generation of ilumi’s Smartbulb has a considerably updated look that is now reminiscent of a high-tech ice cream cone, but its core technology remains largely the same. Most notably, the bulb still uses a Bluetooth connection to pair with your phone, and it’s still rated for 800 lumens (by far the brightest Bluetooth bulb of those we’ve seen lately). What ilumi has done is taken steps to update its app, and in fact it’s in the process of beta-testing a new control app that is due to be formally released in November. Users today can use both the existing app and the new one (listed as “new ilumi” on the App Store) to control their bulbs, switching between the two at will. 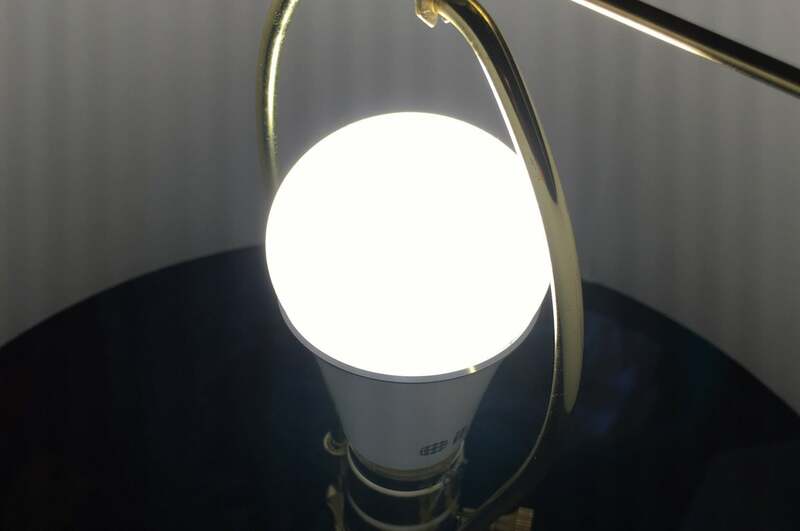 If the ilumi bulb is controlled by a conventional dimmer, it will dim only partially. If the bulb is controlled by a Z-Wave dimmer, it will flicker rapidly when dimmed. As with any Bluetooth bulb, setup of the ilumi A19 is fairly painless, although ilumi still requires users to set up a password-protected account before pairing a bulb to their phone. It’s an extra step that other Bluetooth bulbs in this roundup don’t require, but if you’re concerned about IoT security (and arguably you should be), then you might see this little speed bump as a plus. ilumi has made considerable improvements to its control app, which is much easier to use than the original. 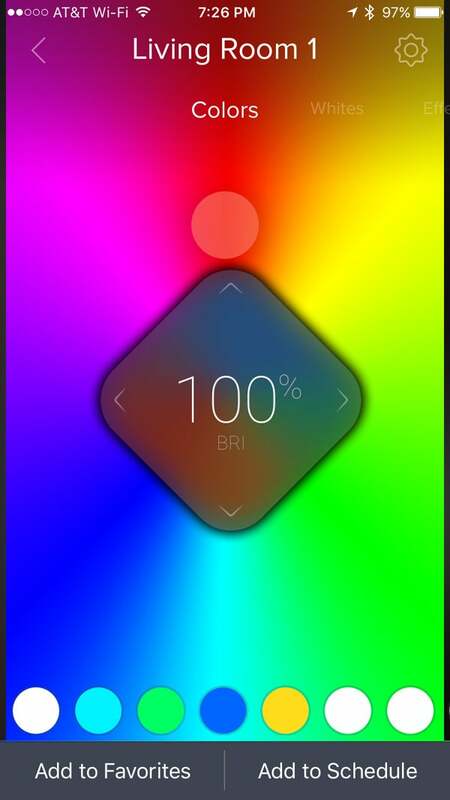 Even though it’s in beta, ilumi’s new control app is an improvement over the old one, using a more intuitive swipe system to bounce among color settings, white light settings, and various effects. A robust scheduling system is also included, which gives you a convenient, color-coordinated look at your lighting schedule, day by day. The control system works well on the whole, with a single exception: It’s too easy to mis-swipe and accidentally, say, turn your light color purple when you were really just trying to swipe over to the “Whites” pane. We hope oddities like this will be remedied as the app emerges from beta. My biggest issue with the latest ilumi bulb, however, is that even though it’s rated for 800 lumens, the bulb feels dim on the whole. While colors pop nicely, whites seem a bit cold in comparison to what they’re supposed to be mimicking. “Natural White” feels a lot like “Greenish Office Fluorescent” to me, though admittedly that name probably didn’t sound appealing enough to use in the interface.